Kickstarter – Regular Pledgers and Regular Failure? Recently, I made a few tweets about the number of Kickstarters and other crowd-funded projects that I get advertised to me on social media. I sometimes doubt the success of some of this advertising, especially when I see what is being advertised to me, but that’s not the thing that grabbed me (some were definitely being targeted well.) 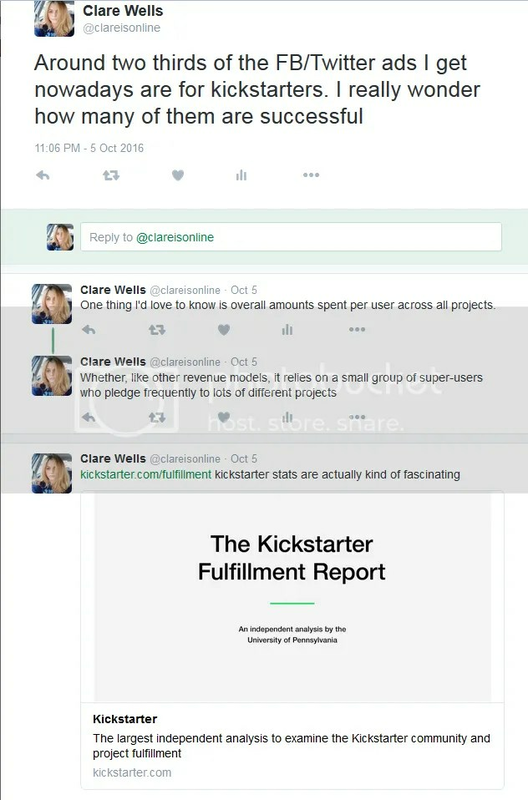 What interested me was the overall success of Kickstarters as a whole, both those that are and aren’t funded. The term that I used, ‘super-users’, isn’t really the correct one (the term super-user refers something totally different) but I’m not fond of the correct term, a ‘whale’, which comes from the mobile app/gaming world and means the tiny fractions of users who put down a most of the money that keeps a micro-transaction based system going. Anecdotally, there seem to be people out there who pledge to kickstarters all the time. I imagine Kickstarter is aware of this frequent userbase and relies on it – that’s why you get projects recommended to you when you log in or once you’ve pledged to something. Since most Kickstarter users have probably pledged once or twice and then never again, the proportion of regulars – people with disposable income who like to be a part of new projects and feel a sense of ownership in a product – is probably very small, worldwide. So while it’s passed off as minor, the statistics quoted in the Kickstarter Fulfillment Report might be quite alarming for them – 9% of funded projects failed to deliver on promised rewards. 9% might not sound like a lot, but for regular pledgers, 1 in 10 of their rewards won’t happen. In it’s earlier days, Kickstarter was rocked by some fairly high-profile failures in various areas (heavily in the gaming sector) but thankfully these didn’t bring the website down as a whole and it’s gone on to produce some fantastic stuff. But they will have to be careful with attrition rate – if regular users have one failure too many.